The "big data" era is characterized by an explosion of information in the form of digital data collections, ranging from scientific knowledge, to social media, news, and everyone's daily life. Examples of such collections include scientific publications, enterprise logs, news articles, social media, and general web pages. Valuable knowledge about multi-typed entities is often hidden in the unstructured or loosely structured, interconnected data. Mining latent structures around entities uncovers hidden knowledge such as implicit topics, phrases, entity roles and relationships. 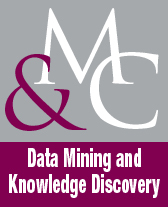 In this monograph, we investigate the principles and methodologies of mining latent entity structures from massive unstructured and interconnected data. We propose a text-rich information network model for modeling data in many different domains. This book also introduces applications enabled by the mined structures and points out some promising research directions. Visit this book abstract page on Morgan Claypool website.